Dilnavaz Variava was one of the only two female students in the first ever batch of IIM-Ahmedabad - the batch of 1964-66. "Academics were wonderful, but there was a bit of social pressure," says the non-executive chairperson of the over 90-year-old Bharat Floorings Group, recalling her post-graduate years. While the prospect of studying with 48 male students was not daunting, mingling with them was a bit of a challenge. "The men often objected to us socialising with a select few of them," Variava recounts. Apart from being the oldest IIMs in India, IIM-Calcutta and IIM-Ahmedabad have another common thread - both the B-schools had only two female students in their first batches. More than five decades later, the situation has improved, although slightly. The average male to female ratio at India's top ten business schools stands at 2.9:1 - 2.9 men per woman. In IIM-Ahmedabad's 2016/17 batch, 21 per cent students were women; in XLRI and IIM-Indore - two of the top 10 B-schools with the highest representation of women students - 35 per cent and 38 per cent, respectively, of the total students who enrolled for the course were women in 2016/17. It is evident that gender diversity has eluded Indian business schools thus far. Most in the fraternity blame it on the rigid social structures and stereotypes, and loopholes in the admission process. The problem arises even before the admission process. "If you go back to the applicant pool, women do not comprise even 50 per cent of the applicants; the challenge starts much earlier," says Uttam K. Sarkar, Professor and Dean, New Initiatives and External Relations, IIM-Calcutta. Sample this: in 2016, when the registrations for the Common Admission Test (the MBA entrance test) or CAT were at a seven-year high, female applicants accounted for only 33 per cent. The largely analytical nature of the CAT has been a bone of contention. Many believe that in its current form, CAT makes it difficult for students from streams other than engineering to get into management colleges, specially the top-ranked ones. The top 25 business schools in India have 80 per cent of their students from engineering backgrounds. And, regrettably, the number of female students enrolling into engineering colleges in India is low. The fallout is that fewer of them get into management institutes. Rishikesha T. Krishnan, Director and Professor of Strategic Management, IIM-Indore, denies having an "an explicit preference for engineering students". "CAT has significant weightage for the quantitative section, and because those who pursue engineering are more quantitatively inclined, they have an advantage," he explains. While CAT is the most preferred entrance test among Indian business schools to check eligibility of students for their management programmes, GMAT (Graduate Management Admission Test), assesses students seeking admission into global business schools. There, too, the participation from women is abysmal. According to GMAC, owner of the GMAT exam, from 2014-2016 the average percentage of women taking the test was merely 28.2 per cent. Even today, parents are hesitant about spending substantially for the higher education of the girl child. "In families where there is a son and a daughter, parents prefer to spend the money on the son, and not on the daughter. The outcome is that fewer women are coming in," says Neharika Vohra, Chairperson, Centre for Innovation Incubation and Entrepreneurship, IIM-Ahmedabad. Professor Sarkar of IIM-Calcutta points out that given the incidence of female students dropping out from elementary school through higher education, their low representation in MBA institutes is not startling. Lately, a concerted effort is being made by colleges to encourage more women students to participate in their programmes. IIM-Indore ascribes four extra marks to female applicants during the shortlist stage (after the CAT); at IIM-C, a female student has a higher chance at getting selected for the interview even if she has the same score as her male counterpart; at Faculty of Management Studies in New Delhi, three additional points are given to female applicants who have cleared the CAT. Institutions are also working towards making the CAT less 'gender-biased'. "We are figuring out if the way in which some questions are framed make it easier for men to answer than women, if there are things that women are interested in as part of the context of the question, or if having a male or female protagonist in the question makes a difference," says Vohra. Besides these, efforts are being made to make campuses safe for women and to ensure basic amenities, such as buses for late night classes, are provided. Foreign nationals in Indian business schools are a rarity, even in the top-ranked institutions. The top 10 Indian business schools together saw enrolment of only 20 foreign students in the year 2016/17. 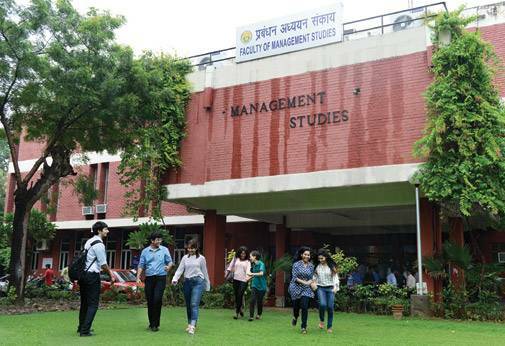 Faculty of Management Studies has 10 foreign students - the highest in any B-school in India - enrolled in its programme, as the University of Delhi (of which it is a part) has a quota of 15 seats for foreigners. "A diverse international candidate pool remains a key challenge as well as priority for top B-Schools," says Gaurav Srivastava, Regional Director, South Asia, GMAC. Mostly, students from the neighbouring countries and African nations come to India for higher education. Others prefer studying in the more developed countries where they are not only offered scholarships, but are assured of better career opportunities after the completion of their course. India has to still emerge as a favourable economic destination to be considered lucrative by foreign students. As a result, B-schools and future employers find it difficult to attract international candidates. GMAC has collaborated with nine leading Indian B-schools for the 'Study in India' initiative to encourage prospective candidates across 27 countries to discover and consider management education options in India. According to Srivastava, the tough regulatory environment - visa and work permit related procedures - does not help matters. Further, only three out of the top 10 B-schools in India have earned a global accreditation. "The global ranking depends on how much diversity there is on the campus, and the kind of research work produced by the colleges. So it is kind of a vicious cycle," says Anindya Mallick, Partner, Deloitte India. With employers, too, expressing keenness to hire women candidates during their placement drives, B-schools are striving to correct the skewed ratio.